ViaVac™ Red/Green is a fluorescent viability dye for yeast, identical in structure to the dye FUN 1®. ViaVac passively diffuses into cells, showing green cytoplasmic staining. In many species of yeast and fungi, in metabolically active cells the dye is actively transported into the vacuole, resulting in red fluorescent staining of tubular intravacuolar structures. Calcofluor White is a fluorescent blue dye that binds to cellulose and chitin, which can be found in the cell walls of fungi, algae, and plants. 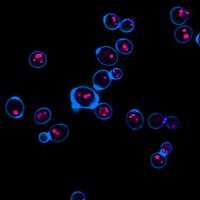 After staining yeast with this kit, both living and dead cells will be outlined in blue, while only living cells will show red fluorescent, vacuolar tubules. FUN 1 is a registered trademark of Thermo Fisher Scientific. 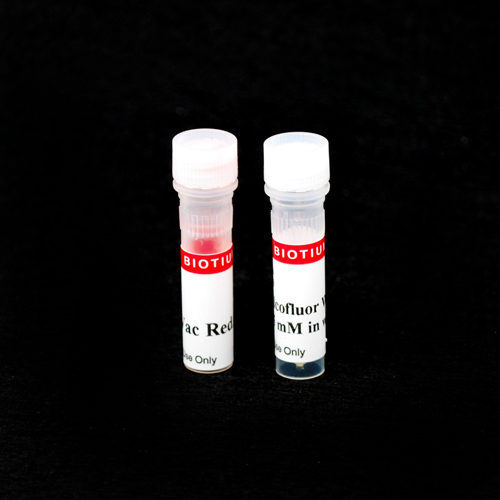 The Yeast Live-or-Dye™ Fixable Live/Dead Staining Kit is a fixable, fluorescent assay to determine yeast viability. The kit contains two fluorescent components, Thiazole Orange and Live-or-Dye™ 568/583. Thiazole orange (TO) is commonly used in reticulocyte analysis to stain residual RNA of blood cells, to stain DNA in agarose gels and capillary electrophoresis. Thiazole Orange stains the yeast nucleus, and is also able to stain bacteria and mammalian cells.